The sight of salt on the roads is an unpleasant one, turning our winter transportation into a scene of wet black sludge, but it is a necessary ugliness. The positives undoubtedly outweigh the negatives in the discussion of road salt, but that doesn’t mean its destructive power should be overlooked. 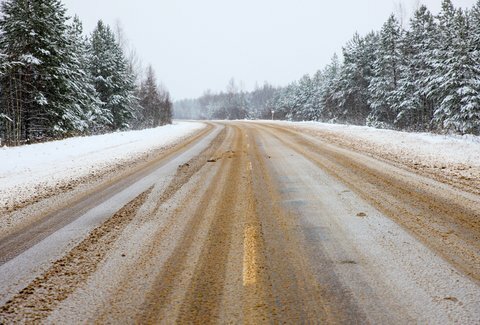 Salt chemically turns ice back into water and adds some traction, so when moisture sits on road surfaces and temperatures plummet, the crash culprit can be addressed quickly and swiftly by municipal or private company trucks. Salt’s strong corrosive power can have a negative impact on cars, mostly in the form of rust. Like so many other auto issues, the problem arises over time, with repeated exposure to road salt. And like so many other auto issues, the lack of need to immediately address it is the reason why it gets out of control in the first place. Unlike brake pads wearing down, we don’t feel or see the damage increasing over time, and it can be eating away at car surfaces in front of our very eyes. When we think of a rusty car, we usually imagine the body of the car covered in rust, which looks bad, but it may not pose a direct concern to the uninformed traveler. Aside from exterior body damage, salt damage can affect more important and safety-oriented mechanisms of the car, such as the brake and suspension systems. While avoiding salt is not an option for those who live in the northern parts of the country, there are some preventative measures that can be taken. A few times throughout the year, particularly after your car has been subjected to high salt exposure, go to a car wash that has an under spray. This will effectively wash off most salt that has settled on the frame, brake, suspension and muffler systems, etc. If you can’t make it to a car wash, you can protect your car yourself with a good preventative wash before the snow hits. Be sure to use car wash liquid and not dish soap or some other alternative, as many will strip wax. A few tablespoons added to the wash water will help to neutralize particularly salty areas. A thorough rinse is also a necessity, and if you want to avoid doors and handles freezing shut, you may want to dry them, too. Some body shops will even offer pre-winter oil sprays to the underside of your car to prevent salt from sticking and chemically bonding with surfaces. Salt damage is important to consider when buying used cars as well. Certain parts of the country are more likely to produce salt-damaged cars on the used market. Anywhere where temperatures drop below freezing in the winter and precipitation is frequent will usually mean that used cars, particularly older ones, will have some degree of salt damage. This is why vintage car enthusiasts often look to the Southwest to purchase decades-old cars. The relative lack of humidity, precipitation and freezing temps leads to less damage over time. Also, check the underside of any used car you plan to buy. If it appears that the surface is not the natural frame, it may have been covered by some coat to hide rust.